7/8 x 3/4-inch Sterling Silver St. Benedict Medal comes on a 24 inch Rhodium Heavy Curb Chain. 3/4 x 3/8-inch Sterling Silver Miraculous Medal. This Sterling Silver Miraculous Medal measures 30 X 20 MM, or roughly 1 and 1/5 inch by 7/8 inch. It comes with a 24-inch Sterling Silver chain and a beautiful jewelry box. 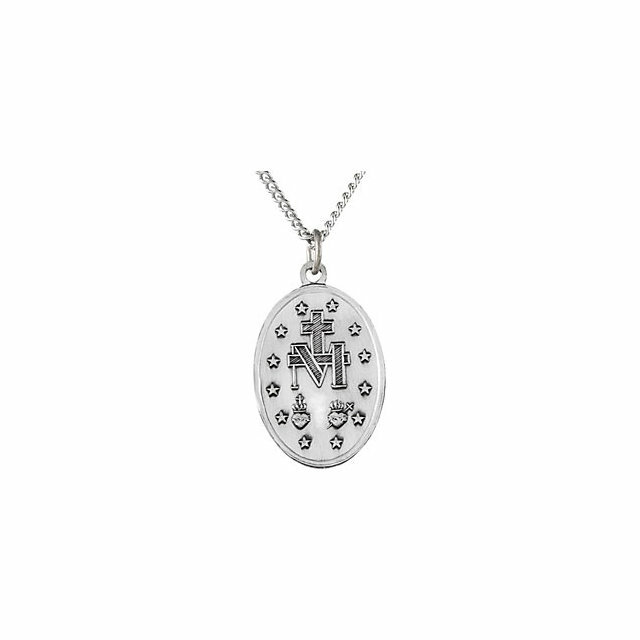 Our Antique Silver Miraculous with 18" Chain features our money-back guarantee. This beautiful Sterling Silver heavy curb chain is endless, which means there is no clasp. It measures 30-inches around, 2.15mm. *When purchased with a Bliss Brand pendant or medal, please make a note in the Comments box (on the last page of checkout near the "submit order" button) stating if you would like the pendant attached to the chain. For all other Brands, please call 1-800-565-9176. Please note, there is no discount for chain substitutions, such as if a medal already comes with a smaller chain but this one is purchased instead for that pendant. The reason for this is because the chains that come with the medals are complimentary, and we've discounted this 30-inch chain substantially because it is mostly used as a replacement chain for people who want something longer. Get 25 pieces for one low bulk price with our 25-Pack of Our Lady Of The Miraculous Medal Holy Card. Only available in this bulk pack. Prayer to Our Lady of the Miraculous Medal Clear, laminated Italian holy cards with gold accents. Features World Famous Fratelli-Bonella Artwork. 2.5'' X 4.5'' 25 Per Pack. 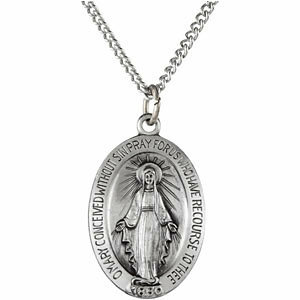 This Large Sterling Silver Miraculous Medal - 50% Off has passed our quality control assessment and meets our strict criteria to be a Catholic Shop product. Buy with confidence.